Solar energy is really the currency of life on earth, from the respiration of algae all the way up to you eating a hamburger, it all comes from the sun. How is most solar energy used? Most of the sun’s energy is not used by life on earth since photosynthesis only harnesses a fraction of incoming solar radiation, but it still captures about 6 times more than the rate of power consumption by all of human civilization. 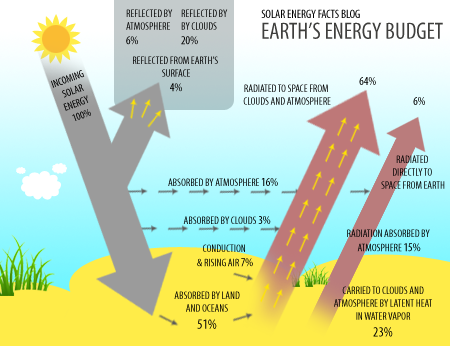 Most solar energy is simply reflected (by clouds or snow) or absorbed (in the atmosphere, land, or oceans). This means that most solar energy is simply moving around the planet in the form of differential heat dissipation. How is solar energy used by humans? We use more solar energy than we realize. For example, all the food you ate today, the heat provided by wood, electricity, or natural gas, and the petroleum used to transport you to wherever you’re reading this – all these are forms of solar energy. We are just breaking into the era of solar power, where solar energy is converted directly into electricity. At present, only 1% of homes in the United States have solar panels installed, but there are many technologies being developed and refined that should increase the total amount of solar energy production. Among the most notable are solar thermal energy systems, which convert solar energy into heat or electricity at higher efficiencies than solar panels. Leave a comment on How is Solar Energy Used?